Showing results for tags 'dual exhaust'. For the guys with dual exhaust. I'm in the process of fabbing up a set of headers. And I've gotten to the part of pipe size and mufflers. As of now I'm running vintage 1948 pipe and muffler. It sounds like a hi performance sewing machine. Looking for input on exhaust pipe size so I can build past the primary pipes. 2 or 2 1/2" and good sounding mufflers. As of now I'm set for 1 1/2" primary hot rolled .125" wall for primary tube into a v band collector. Since I'm fairly new to flat motors I'm open to suggestions. Good sound is what I'm looking for. Intake is a 2 carb Fenton. Cam is stock grind. Might have a Fenton head on lock if we can agree on price. Thanks. Just saw that Langdon's Stovebolt now sells cast dual exhaust manifolds for Desoto and Chrysler 25" blocks. 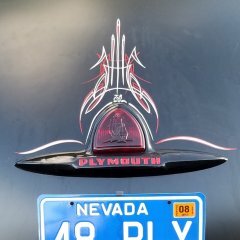 http://www.langdonsstovebolt.com/store/online-catalog/#!/Chrysler-Spitfire-Headers-PRE-ORDER/p/52183451/category=412417 Langdon has had them for the Dodge and Plymouth blocks but now we can put them on our 25" blocks too.